Proverbs 24 | You Are Not the Only One Ministries and Consulting Services Inc.
Our Relationship with the Godhead. 23 These things also belong to the wise. It is not good to have respect of persons in judgment. 24 He that saith unto the wicked, Thou art righteous; him shall the people curse, nations shall abhor him: 25 But to them that rebuke him shall be delight, and a good blessing shall come upon them. James talks about being impartial in how we judge and act towards others” James (KJV) 2:1 My brethren, have not the faith of our Lord Jesus Christ, the Lord of glory, with respect of persons. 2 For if there come unto your assembly a man with a gold ring, in goodly apparel, and there come in also a poor man in vile raiment; 3 And ye have respect to him that weareth the gay clothing, and say unto him, Sit thou here in a good place; and say to the poor, Stand thou there, or sit here under my footstool: 4 Are ye not then partial in yourselves, and are become judges of evil thoughts? 5 Hearken, my beloved brethren, Hath not God chosen the poor of this world rich in faith, and heirs of the kingdom which he hath promised to them that love him? 6 But ye have despised the poor. Do not rich men oppress you, and draw you before the judgment seats? 7 Do not they blaspheme that worthy name by the which ye are called? 8 If ye fulfil the royal law according to the scripture, Thou shalt love thy neighbour as thyself, ye do well: 9 But if ye have respect to persons, ye commit sin, and are convinced of the law as transgressors. 29 Say not, I will do so to him as he hath done to me: I will render to the man according to his work. A Christian will love even their enemies and do good even for someone who trash talks them. Luke 6:27-36 (NIV) Love for Enemies 27 “But to you who are listening I say: Love your enemies, do good to those who hate you, 28 bless those who curse you, pray for those who mistreat you. 29 If someone slaps you on one cheek, turn to them the other also. If someone takes your coat, do not withhold your shirt from them. 30 Give to everyone who asks you, and if anyone takes what belongs to you, do not demand it back. 31 Do to others as you would have them do to you. 32 “If you love those who love you, what credit is that to you? Even sinners love those who love them. 33 And if you do good to those who are good to you, what credit is that to you? Even sinners do that. 34 And if you lend to those from whom you expect repayment, what credit is that to you? Even sinners lend to sinners, expecting to be repaid in full.35 But love your enemies, do good to them, and lend to them without expecting to get anything back. Then your reward will be great, and you will be children of the Most High, because he is kind to the ungrateful and wicked. 36 Be merciful, just as your Father is merciful. 9 The thought of foolishness is sin: and the scorner is an abomination to men. It is better to desire the Kingdom of God than to desire sin. We discussed sowing and reaping before. 10 If thou faint in the day of adversity, thy strength is small. 15 Lay not wait, O wicked man, against the dwelling of the righteous; spoil not his resting place:16 For a just man falleth seven times, and riseth up again: but the wicked shall fall into mischief. Remember Stephen and how he acted when faced with his upcoming death! He did not give in. So should we when we face challenging situations. 1 Be not thou envious against evil men, neither desire to be with them. 2 For their heart studieth destruction, and their lips talk of mischief. 8 He that deviseth to do evil shall be called a mischievous person. There is no point in coveting what an evil person has. They are generally unhappy people who can sleep soundly. 11 If thou forbear to deliver them that are drawn unto death, and those that are ready to be slain; 12 If thou sayest, Behold, we knew it not; doth not he that pondereth the heart consider it? and he that keepeth thy soul, doth not he know it? and shall no the render to every man according to his works? In this day an age, no one can say that they did not know that what they were doing is wrong. the last 6 of the ten commandments and result in criminal actions being brought against us. Stealing is against the law. Lying under oath results in imprisonment. Adultery is a causal reason for divorce – even in the courts. 30 I went by the field of the slothful, and by the vineyard of the man void of understanding; 31 And, lo, it was all grown over with thorns, and nettles had covered the face thereof, and the stone wall thereof was broken down. 32 Then I saw, and considered it well: I looked upon it, and received instruction. 33 Yet a little sleep, a little slumber, a little folding of the hands to sleep: 34 So shall thy poverty come as one that travelleth; and thy want as an armed man. In the final analysis, a lazy person reaps what they have sown. Nothing from nothing bring nothing! 5 A wise man is strong; yea, a man of knowledge increaseth strength. 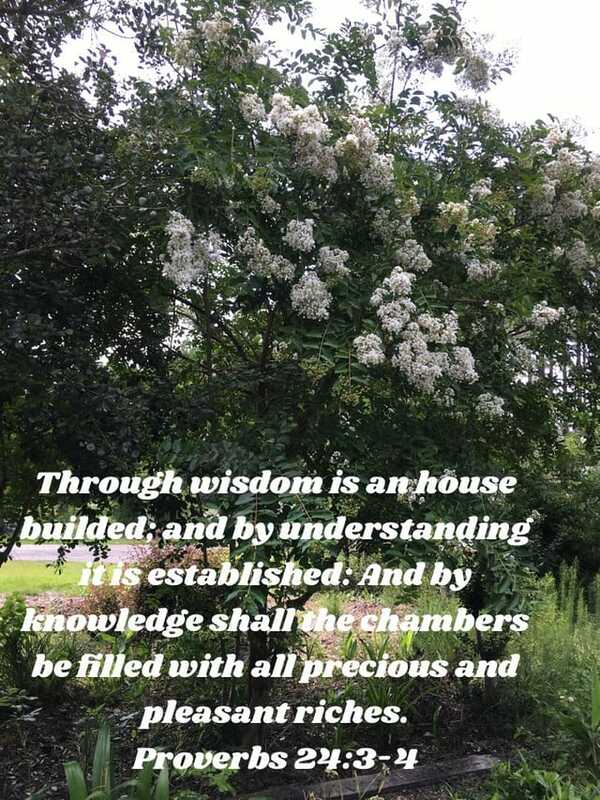 6 For by wise counsel thou shalt make thy war: and in multitude of counsellors there is safety.7 Wisdom is too high for a fool: he openeth not his mouth in the gate. Wisdom is valued and a crucial part of any decisions that a person makes. A king does not go to war without taking advice from his counselors.13 My son, eat thou honey, because it is good; and the honeycomb, which is sweet to thy taste:14 So shall the knowledge of wisdom be unto thy soul: when thou hast found it, then there shall be a reward, and thy expectation shall not be cut off. Wisdom and the acceptance of wise makes a wise leader’s decision making as sweet as honey.